For a major network of hospitals, Ayoka’s application development team created a Hospital Data Management Solution to manage electronic medical records (EMR) for reporting on healthcare quality and patient safety. The Hospital Data Management Solution provided hospitals with a software tool to ensure compliance with state mandated data submission requirements. This hospital management solution combined extraction, transformation and loading (ETL) capabilities to merge EMR files and remove personally identifying healthcare information from the EMR files. Data aggregation and business intelligence are built into this hospital management solution to automate reporting on quality and patient safety, while providing the capability to merge files originating from different EMR systems that are operating on different end-user environments. By automating these processes, individual hospitals are able to reduce labor costs to perform hospital data management, plus avoid fines and other government penalties for incomplete data submission. 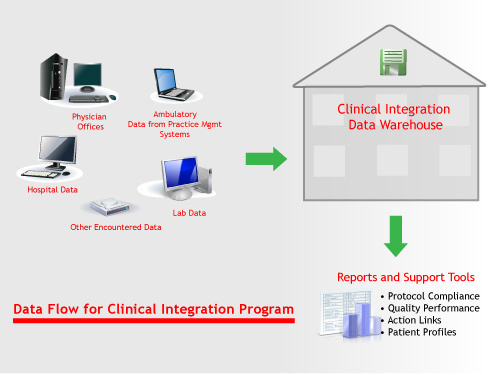 Based on hospital data reporting requirements, Client needs to collect electronic medical record (EMR) data from multiple hospital sources in different formats, perform error checking and data cleansing, then upload into a data warehouse that can provide business intelligence reporting and critical KPIs. Ayoka develops a data cleansing and transformation system, performing extraction, transformation, and loading (ETL) using SQL Server Integration Services (SSIS). Dashboards and business intelligence reports are developed using multidimensional expressions (MDX) to build cubes in the data warehouse. Reduce risk of monetary fines due to late EMR submissions. Reduces time for reporting, while building more relevant reports and KPIs to operate the hospital. Reduces development costs to create custom reports and KPIs.